Albert was born in 1896, the fifth son and sixth child of George Smith and his wife Mary Ann. George senior was a blacksmith, born in Donnington, and did not travel far from his roots. His first children, Margaret Mary (1887) and Cecil Stuart (1888), were born in Bagnor, a short walk from the heart of Donnington village. The next three children, Isaac William (1891), James Henry (1892) and George Herbert (1893) arrived while the family was living in Speen; in truth Bagnor is a hamlet of Speen, and ‘Speen’ usually refers to the main village, Church Speen. One more child born in Shaw, Ernest Albert (1896) and finally, three more, Edith Annie (1899), Maude (1906) and Arthur (1909), in Newbury show the family’s moves over the years. In Newbury they settled in Falcon Court, a small alley of three cottages that opened off Northcroft Lane, between the Temperance Hall and the former Child’s Almshouses. Their house, No 2, was a small four-roomed cottage that must have been very cramped if the whole family were there at once. However, the older children were flying the nest by the time their youngest siblings arrived. Isaac, the third child, opted for a job in khaki, signing up with the Royal Berkshire Regiment in January 1909 and served with the 2nd Battalion in India. Around the end of 1910 another brother, George Herbert, followed Isaac’s example and joined him in India in 1912 after training in England with the 1st Battalion Royal Berks, stationed at Dover Castle. Aged 15 at the time of the 1911 census Albert was working as a newspaper boy having finished school, probably at the age of 13. When war broke out in August 1914 Albert was 18 and eligible for military service. However, he does not appear to have followed the example of his elder brothers instead remaining at home. Perhaps he was influenced in this by his parents, who already had four sons serving and wouldn’t want to risk more. Given his age it was inevitable that he would end up in uniform and he may well have chosen to enlist with a home service unit of the Berkshire Yeomanry in an attempt to avoid the trenches. If he did it only worked for a while, he was eventually drafted into the 6th Battalion of the Royal Berkshire Regiment, very possibly as a replacement after their heavy losses in the early days of the 3rd Battle of Ypres. As his service record has not survived, it is impossible to know for sure. What is certain is that he was with the 6th Royal Berks by the time they were temporarily attached to the 55th Brigade in order to support an attack on Poelcappelle and Meunier House. When the battalion moved forward in the second wave of the attack on 12 October 1917 they found that the first wave had not achieved its objectives and that the attack had faltered badly in the face of heavy resistance. The following day they were ordered to withdraw by ones and twos through a new line being hastily prepared behind them by the 7th (Queen’s Own) West Surrey Regiment. A Company made it back without too many problems, but the other Companies found a daylight withdrawal too costly and waited for dusk before falling back. It was on this day that Albert died of wounds at a Casualty Clearing Station at Mendinghem (known to the Tommies as mending ‘em). It is possible that he received the fatal wounds that same day or in the attack on the preceding day. The family record of Mr and Mrs G Smith of Falcon-court, is extremely creditable. They have had five sons serving in the Army, three of whom have paid the great sacrifice. Isaac William has served seven years , and has been twice wounded. George, who has been five years in the Army, was killed in the battle of Neuve Chappelle. James Henry was killed in action after being in the Army 10 months, as also Ernest Albert on October 13th, 1917, having served one year and nine months. Cecil Stuart is at present serving with the forces. Two daughters were employed on munition work, one having died, and the other being on the sick list. Albert was buried in grave VI.E.21 at Mendinghem Military Cemetery. Locally he is remembered on Panel 10 of the Newbury Town War Memorial and both the parish memorial board and roll of honour in St Nicolas’ Church, Newbury. 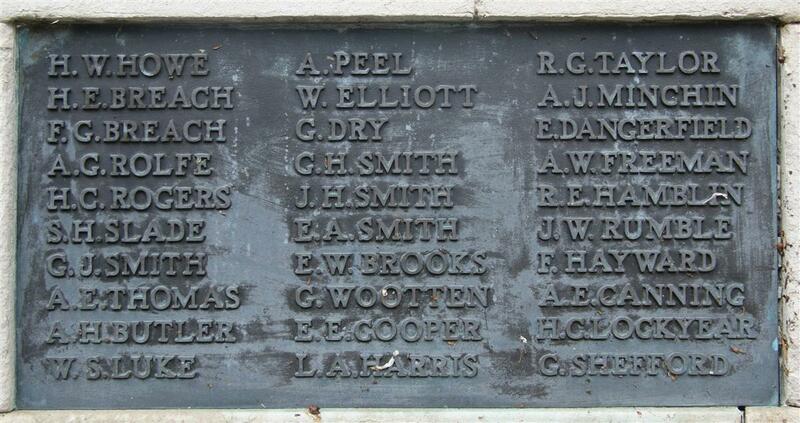 He was also remembered on a memorial board in Speenhamland School, now lost. The same memorials also remember the names of his brothers, George Herbert and James Henry, who also lost their lives on the Western Front. Isaac survived the war but was wounded twice, the second occasion resulting in his discharge from the Army on 27 July 1916. Another brother, Cecil Stuart also donned the khaki uniform and survived; the sixth and final brother, Arthur, was too young to serve. The sister reported in the paper as having died was probably the eldest, Margaret Mary; the death of a Margaret Smith was registered in Newbury in the April-June Quarter of 1917. The second sister employed on munition work was, Edith Annie; the third and final sister, Maude, was only eleven at the time.